The Rutles is a pop group from London, England. A spoof of the massively popular and influential rock group The Beatles, The Rutles was the brainchild of Neil Innes, former member of The Bonzo Dog Doo-Dah Band, and ex-Monty Python member Eric Idle. The four official members of The Rutles were Dirk McQuickly (Eric Idle), Ron Nasty (Neil Innes), Stig O'Hara (Ricky Fataar) and Barry Wom (John Halsey), parodies of Paul McCartney, John Lennon, George Harrison and Ringo Starr, respectively. However, Eric Idle did not contribute to the actual musical recordings. The "Paul" vocals were performed by Ollie Halsall, who was glimpsed shortly in the mockumentary The Rutles: All You Need Is Cash as "Leppo," the "fifth Rutle." Idle lipsynced to the music skits featured in the film. The Rutles originated as a sketch filmed for Idle's Rutland Weekend Television in the mid-1970's, albeit with a different cast of characters: Idle, for instance, portrayed the character "Dirk," which was at that time the parody equivalent of George Harrison, not Paul McCartney. The sketch was originally aired on Saturday Night Live; producer Lorne Michaels enjoyed the sketch so much that he produced a TV movie that became known as The Rutles: All You Need Is Cash, a mockumentary which is regarded as a precursor to such films as This Is Spinal Tap. The film parodied all aspects of The Beatles' career, such as the Yellow Submarine animated film and the "Paul is Dead" rumors. Ex-Beatle George Harrison, a fan of Monty Python (and later executive producer for Monty Python's Life of Brian) appeared as a reporter interviewing the press manager for The Rutles, played by Idle's Monty Python colleague Michael Palin. Originally aired on television in 1978, the film was ignored upon its initial release, but became a home video sales success. Neil Innes, under the pseudonym Nasty/McQuickly (a parody of Lennon/McCartney, whom a majority of Beatles compositions are attributed to), wrote all The Rutles' songs, borrowing heavily from Beatles riffs, chord formations, and lyrics. Additionally, songs were also written using the pseudonyms of Stig O'Hara and Barry Wom. Their first studio album, The Rutles, was released as the soundtrack for All You Need Is Cash in 1978. 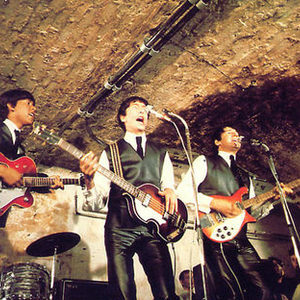 Due to copyright lawsuits from Apple Corps, six of the songs were removed from the first LP release, and The Rutles' song catalog became property of Apple Corps. In 1996, Innes, Fataar, Halsey and John Haber (the replacement for Halsall, who had passed away) released Archaeology, a spoof of The Beatles' Anthology series, consisting of supposed "cut" material written for The Rutles and previously unreleased songs. In 2002, the sequel to All You Need Is Cash, called The Rutles 2: Can't Buy Me Lunch, aired on selected TV channels. It featured little to no involvement from Innes, Fataar and Halsey, and consisted mainly of unaired footage from the first film interspersed with interviews with celebrities and their experiences with The Rutles.